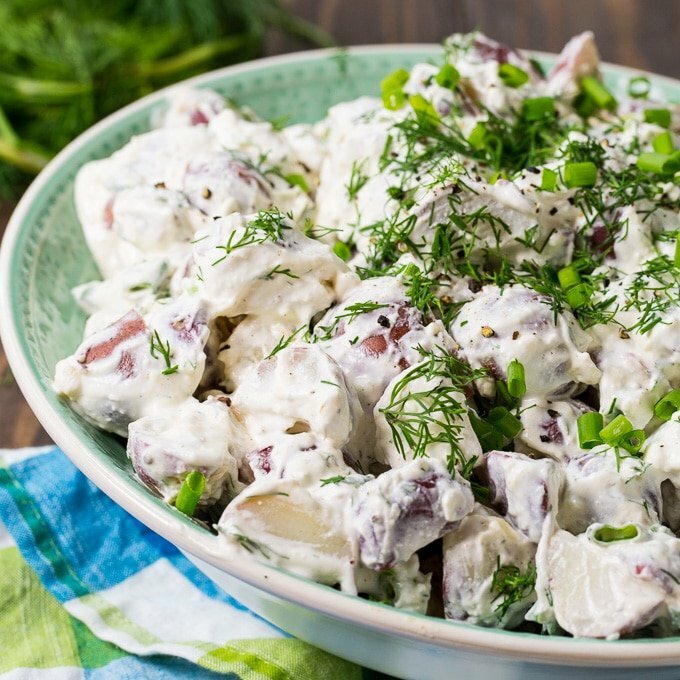 Creamy Dill Potato Salad is a fabulously delicious, but simple potato salad loaded with the flavor of fresh dill. 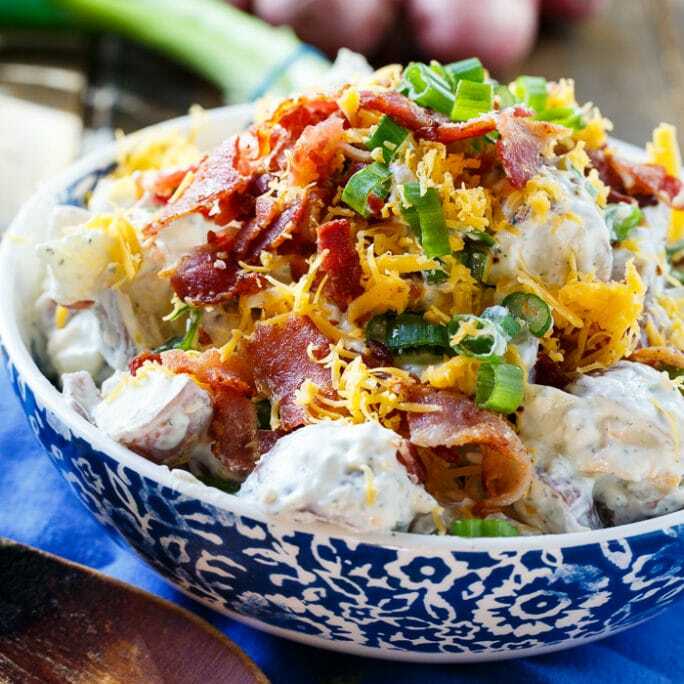 The chunks of red potato are heavily covered in a sour cream-based dressing. I love all types of potato salad. 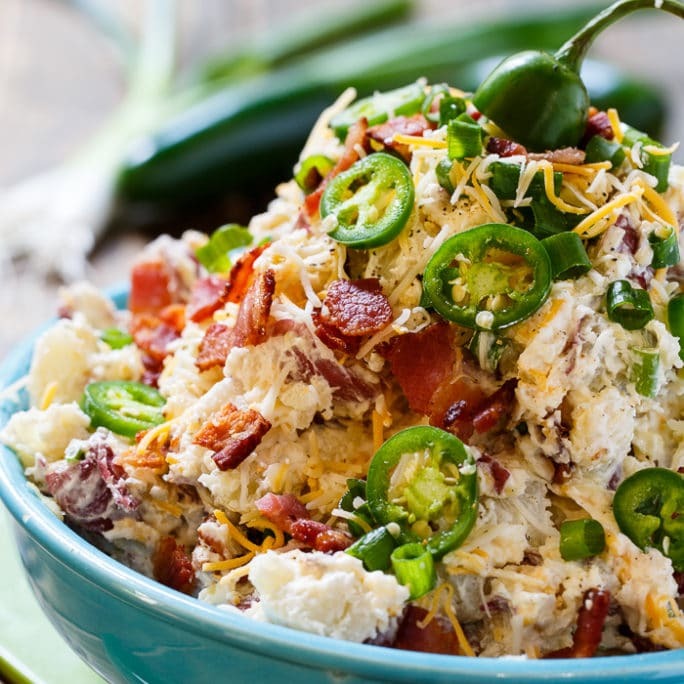 This Southern Potato Salad is probably my favorite. 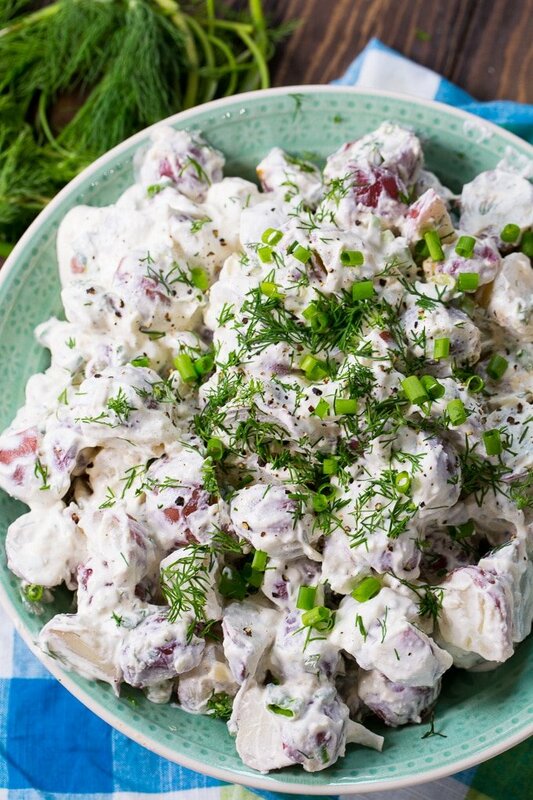 But sometimes I’m really craving a dill potato salad like this one. Made with red potatoes, LOTS of sour cream (plus mayo), green onions, and plenty of dill. And that’s about it. The flavor of the sour cream and dill together is like magic and there’s no need for much else. I do add a splash of apple cider vinegar to perk up the flavor and a sprinkle of seasoned salt (Lawry’s is my favorite) and celery salt. 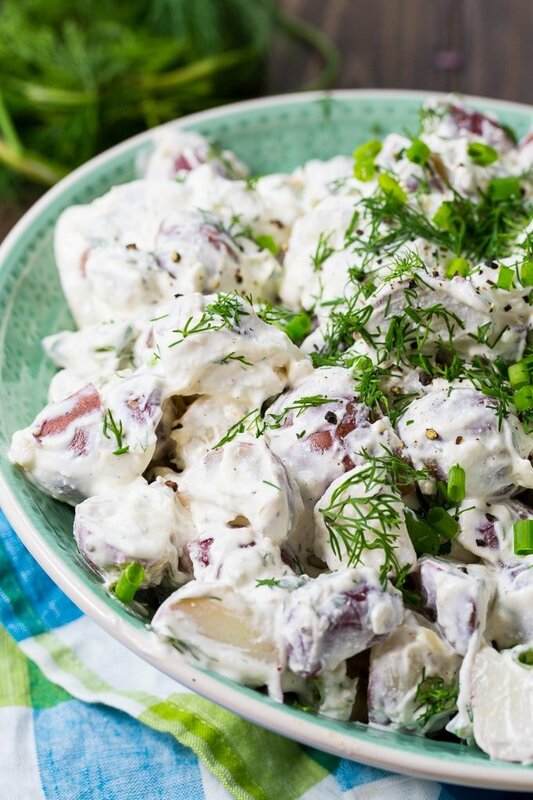 Every picnic should have a bowl of Creamy Dill Potato Salad! 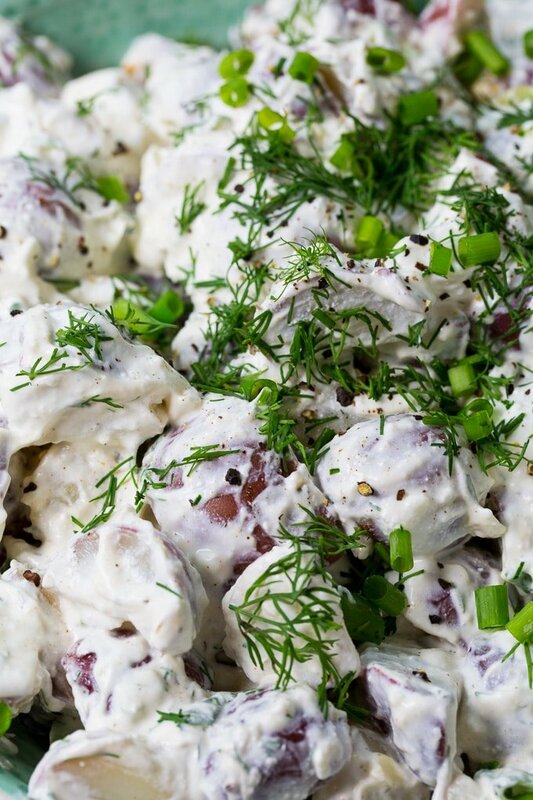 Creamy Dill Potato Salad is a fabulously delicious, but simple potato salad loaded with the flavor of fresh dill. Place potatoes in a large pot. Cover with water and add 2 teaspoons salt. Bring water to a boil. Reduce heat and simmer until potatoes are soft, about 15 to 20 minutes. Drain potatoes. You can leave the skins on or peel them. Cut each potato in half or quarters, depending on size. Place potatoes in a large bowl and drizzle with the vinegar. Add mayonnaise, sour cream, seasoned salt, celery salt, and pepper. Stir well to mix. Stir in green onions and dill. Cover and chill at least 1 hour. This entry was posted in Salads, Side Dishes and tagged dill, potato salad. Bookmark the permalink. This creamy dill potato salad was excellent, I did not change a thing . Used some Cajun seasoning for the seasoned salt as suggested. My family is asking for more. It’s one of my favorites! So happy you enjoyed it Nancy!